Some of our readers are asking for more information but we’re sorry to say we don’t have any and we dont know when the EP will be really out. No one in our team could find it yet. 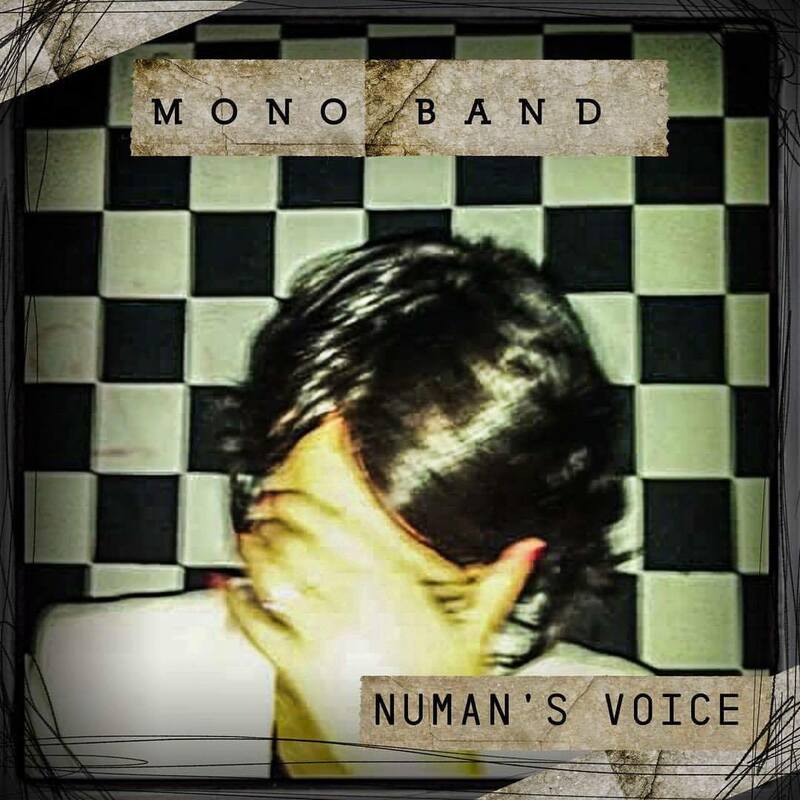 So, to anyone reading this: Does your local iTunes or Spotify have the new Mono Band EP? Numan’s Voice: New release by Mono Band? Few years ago Noel has recorded demo tracks with Fin Chambers for Mono Band project. It looks like it’s time to finally release them! Also Johanna Wiseley (The Cranberries’ live back vocalist) has lent her voice for at least one Mono Band song. Let’s hope we’ll finally hear it! All size Medium in both men’s and women’s. 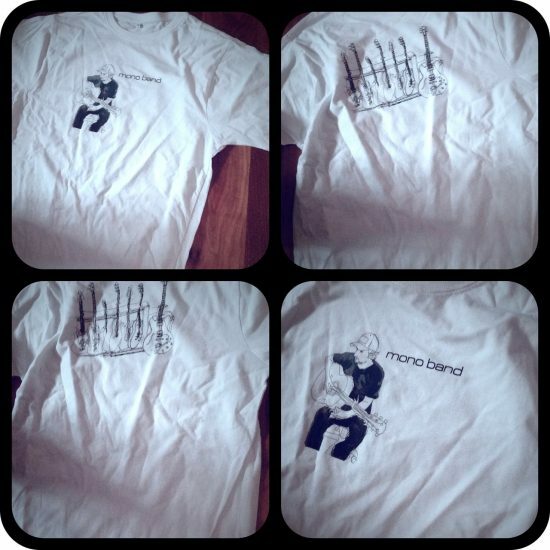 Mono Band T-Shirts on eBay now! As reported in January, a few years ago Noel played guitar as a “guest guitarist” on a track by Polish band Zerova. As it turns out, the track is actually called “Józiu”. 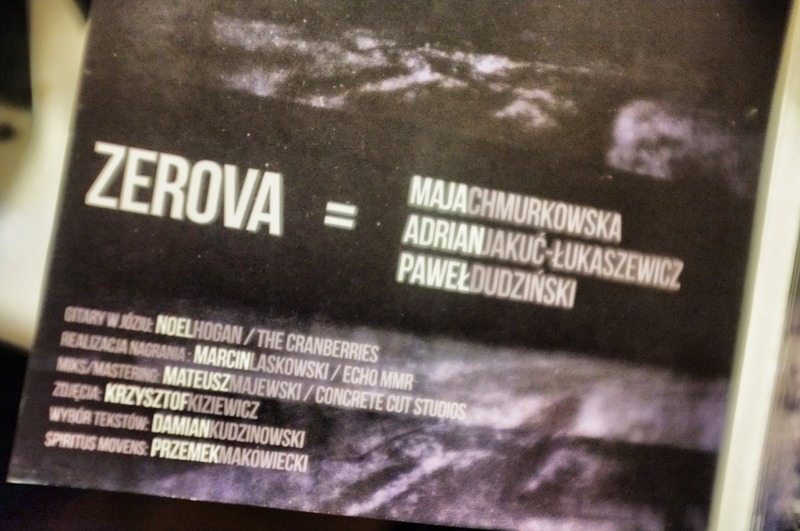 It is the first single from Zerova’s album “Gombrowicz” which is going to be released this month. It was a busy week, some of the new tracks came back from the vocalists. Really sounding great. Went to LIT [Limerick Institute of Technology] for and gave a short lecture on Writing/recording. New tracks for the City Of Culture album have been coming in, some very interesting stuff. 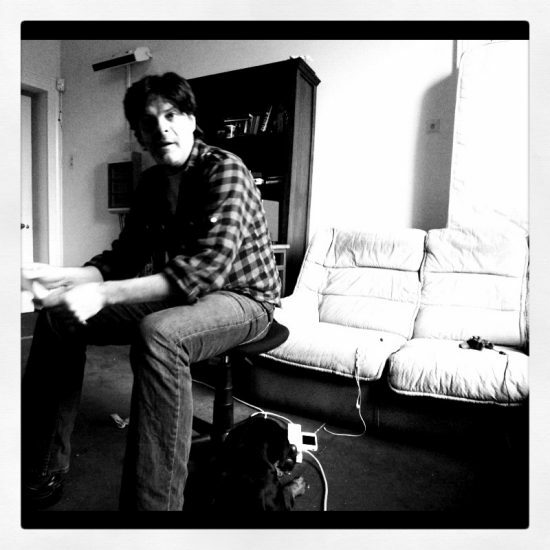 Guitarist Noel Hogan has shared his old demo recording from 2006: a song called “Roads”. The song has vocals from a long-time Noel’s collaborator, Richard Walters, and most likely was recorded for the Arkitekt project which started to take shape at that time. It remains unclear whether this song will see the light of day or not. 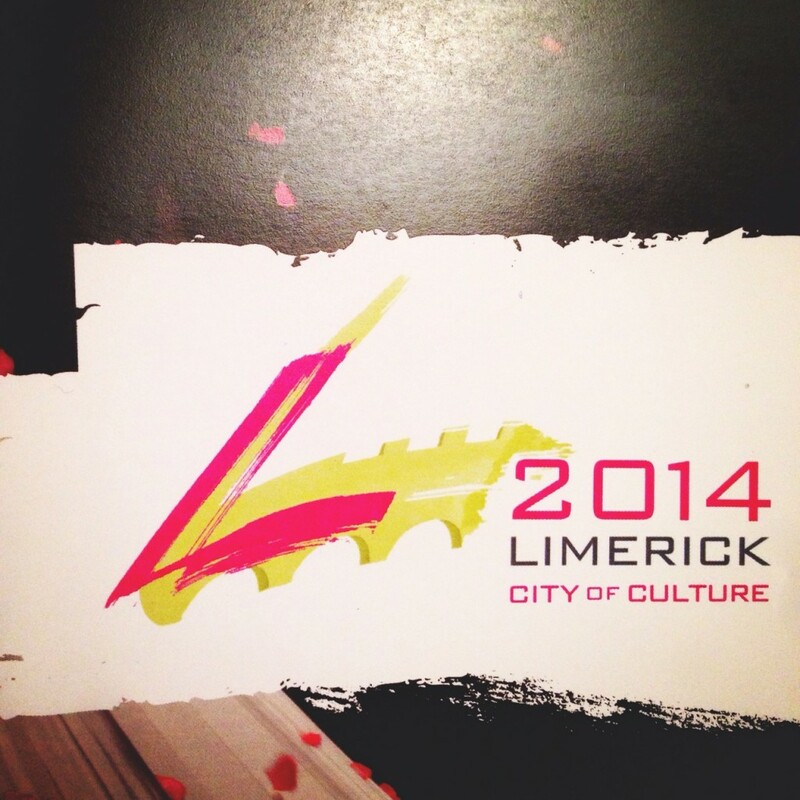 Limerick will definitely be the place to be in 2014! The Irish city is indeed officially declared “National City of Culture” for the whole next year. 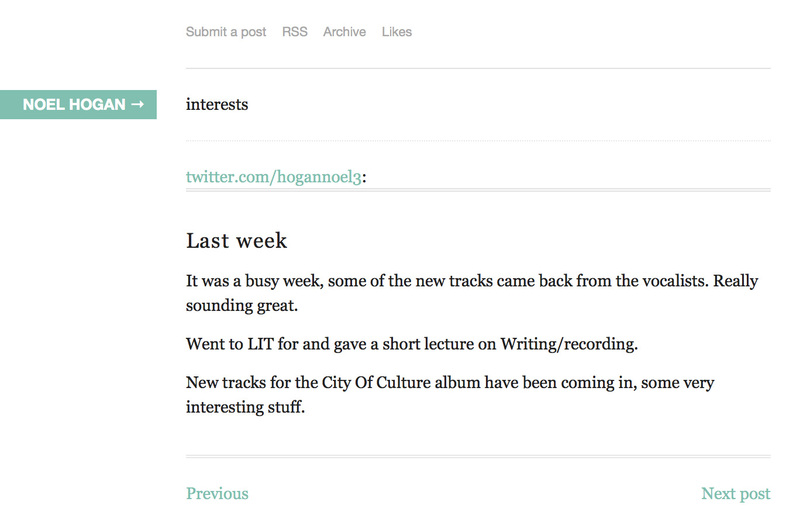 If you read Noel Hogan’s messages on Tumblr, you may have already seen his recent posts about the “Limerick City of Culture 2014” and followed his collaborative production projects for the town. And here comes the next step today, the Limerick Leader just announced that Dolores O’ Riordan will be performing at the first ever New Year’s Eve concert to take place in Limerick. Something quite obvious when we all know that The Cranberries are still the biggest hometown band to this day! Immediate notice: why Dolores solo and not The Cranberries? If you’d like to go to the show, tickets will go on sale tomorrow (Friday) on Ticketmaster. A crowd of up to 2,800 people will packed into Merchant’s Quay in front of City Hall for the ticket only gig. Dolores will be joined by the Irish Chamber Orchestra for an “exclusive worldwide performance” to open Limerick’s stint as National City of Culture. Other artists are planned and names will be revealed in the coming weeks. The show will be broadcast on Irish TV RTÉ. 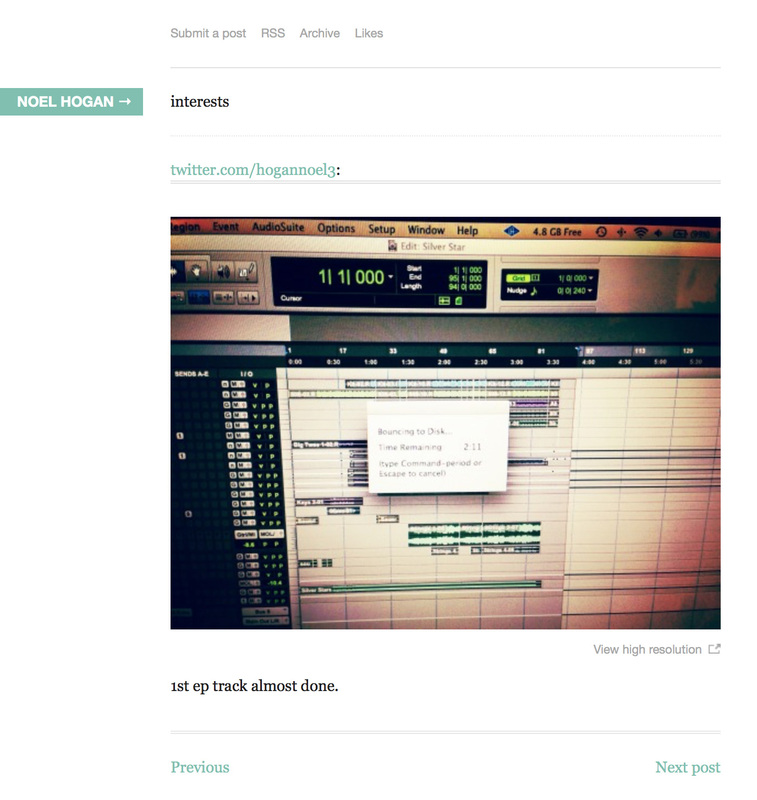 As reported before, The Cranberries guitarist Noel Hogan is working on a new EP, most likely the new Mono Band EP. 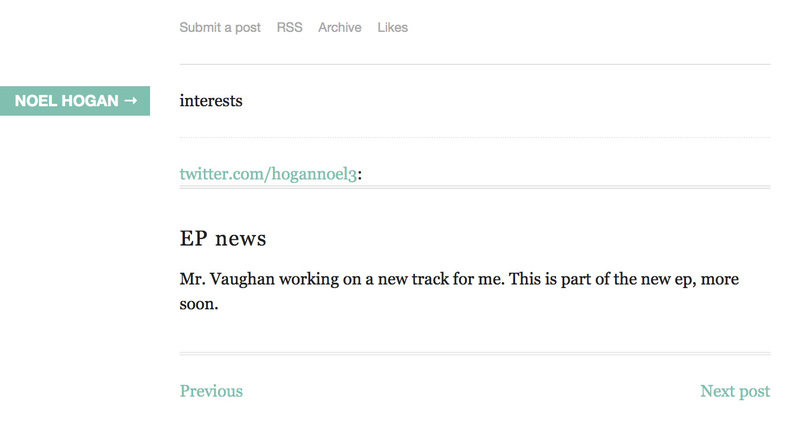 And according to his latest Tumblr post below, one of the tracks is going to be produced by an old friend. Mr. Vaughan working on a new track for me. This is part of the new ep, more soon. “Mr. Vaughan” is obviously Matt Vaughan, producer and programmer who briefly worked on The Cranberries’ 6th album demos in 2003. He also worked with Dolores O’ Riordan and Noel Hogan on their first solo demos in 2003-2005. All in all, this means that Mr. Vaughan is no stranger to the Cranberries world so we can expect some really exciting material from the new Mono Band EP. 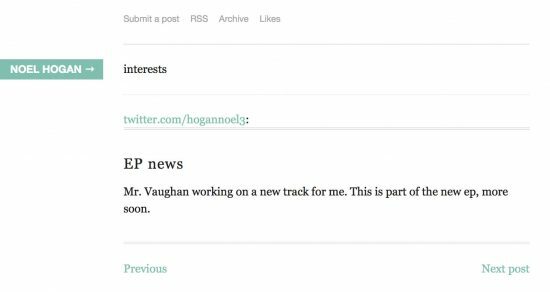 A never-heard-before Mono Band song entitled “Track 29 (demo edit)” was posted today on SoundCloud by the man himself, Noel Hogan. “Track 29”, a collaboration with vocalist Richard Walters, was most likely recorded in the period of time between the first Mono Band album and the Arkitekt project. Other songs posted today on Noel Hogan’s SoundCloud include “Army of Mice” (2005), “Track 26” (2006) and “Pacing (acoustic version)” (2009), all recorded with Richard Walters. The first two tracks were briefly posted on Mono Band’s MySpace page in the mid-2000’s while the latter was released on Arkitekt’s “14 Days” single. Thanks to Noel for this lovely New Year’s surprise! In celebration of the “Mono Band Week”, Cranberries World features a Mono Band song every day of this special week. Today’s the last day and we end this special week with the latest Mono Band track “Won’t Leave No More” featuring Fin Chambers. In 2011, Noel brought Mono Band back to life by working on 5 new songs, three of them (“Waking Up all Over”, “Won’t Leave No More”, “Your Broken State”) confirmed to have been recorded with vocalist Fin Chambers. “Won’t Leave No More” was released on a charity compilation entitled “Life Support” in April 2012. “Life Support” is a compilation of exclusive tracks from some of the Ireland’s finest artists in aid of the Pieta House, a suicide and self-harm crisis centre located in Limerick. Fin Chambers is the former lead singer of Irish band Woodstar. In 2005, he contributed two songs with Mono Band: “Release” (Mono Band album) and “She’s So Blue” (a free download track available on Mono Band’s official website at the time). 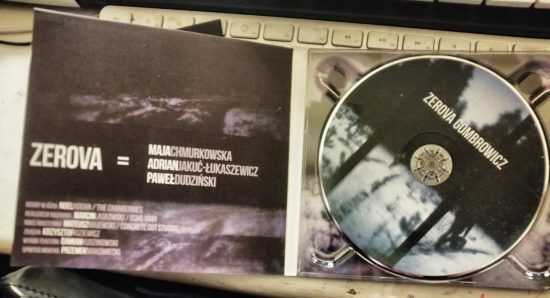 The CD version of “Life Support” is available on Delphi label while the digital version can be found on Band Camp. In celebration of the “Mono Band Week”, Cranberries World features a Mono Band song every day of this special week. Today’s pick is none other than “Black Hair” featuring Richard Walters. The “Black Hair” demo was first posted as a Mono Band song on the Mono Band MySpace page in February 2006. It was later offered for purchase on Indiestore in June 2006, also as a Mono Band track. 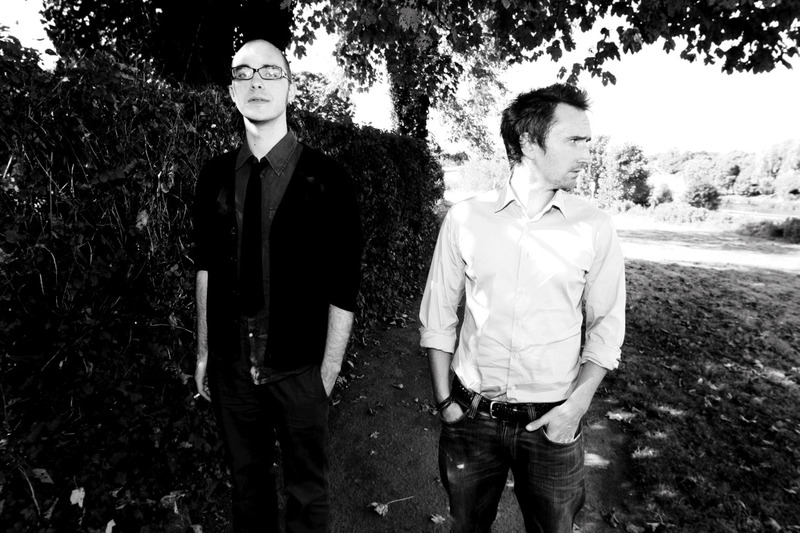 The final version, produced by Bernard Butler, was released in October 2007 on Arkitekt’s “Black Hair” EP. In 2011, Richard Walters released a new version of the track on his second album “Pacing”. Richard Walters was the main Mono Band/Arkitekt contributor over the years. In 2007, Noel and him continued working together under the band name Arkitekt, which was more guitar-oriented and less electronica. Two years later, Walters released his first solo album “The Animal” then “Pacing” in 2011 and the “Young Trees” EP later that same year. Richard is about to release a new album “Regret Less” which is now available as a pre-release on pledgemusic.com. In celebration of the “Mono Band Week”, Cranberries World features a Mono Band song every day of this special week. Today’s song is none other than “Hollow Man” featuring Nicolas Leroux. The song, which was also registered to the American Society of Composers, Authors and Publishers database (ASCAP) as “No Crisis Allowed”, is the only Nicolas Leroux track on the Mono Band album, although the French singer and songwriter is known to have work on a second track. 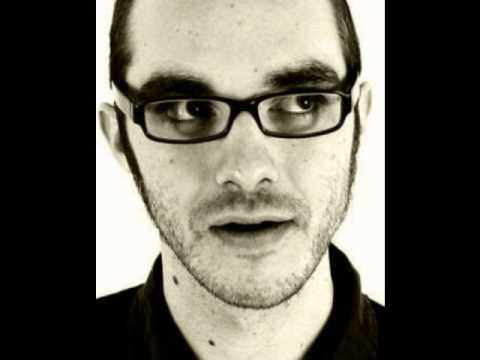 Nicolas Leroux was the lead singer of French band Overhead, which released “Silent Witness” in 2002. The French vocalist also pursue his singing career as The Fugitive Kind. The mystery is over: here is an exclusive 40-second audio clip of Mono Band’s never-before-heard-of track called “Harder Than You Think” and featuring a brand new collaborator, Evi Vine. The audio clip, kindly offered by Noel himself for Cranberries World’s “Mono Band Week”, is the second of two unreleased tracks which are being revealed to fans for the first time ever! Note that CW does not have the whole track! Evi Vine is a singer/songwriter emerging from the UK’s underground music scene. Her debut album “…And So The Morning Comes” was released in April 2011. In celebration of the “Mono Band Week”, Cranberries World features a Mono Band song every day of this special week. Today’s song is none other than “Miss P” featuring Alexandra Hamnede. The song was produced by Noel Hogan, Matt Vaughan and Stephen Street. Also remixed by Steve Hillier and Ming & FS. Swedish singer Alexandra Hamnede co-wrote four songs on the 2005 “Mono Band” album, more than any other artists featured on this album. Throughout her career she has done a considerable amount of studio work, both as a lead and backup singer. She will be featured on one track (“Seriously”) on Afterlife’s new album “The White Island” to be released in September. You can buy the “Run Wild” CD-single (which also features the original version and Steve Hillier mix of “Miss P”) and the “Mono Band” album from the Gohan Records website. Both releases are also available as a digital download on the Gohan Records website and on most iTunes stores. Both remixes of “Miss P” are available on the iTunes version of Mono Band’s “Remixes“album. In celebration of the “Mono Band Week”, Cranberries World features a Mono Band song every day of this special week. Today’s song is none other than “Crazy” featuring Kate Havnevik. The song is one of the highlight of the 2005 “Mono Band” album according to many reviews. A demo version of the song was released as a free download on Kate Havnevik’s website in April 2006. The song was also performed live by Alexandra Hamnede on several Mono Band shows. Norwegian singer Kate Havnevik performed with acts such as Röyksopp (“Only This Moment”) before releasing her first solo album “Melankton” in 2006. The first part of her follow up album “You” was released earlier this year while the second part is set to hit the stores this autumn. The 2005 Mono Band album, which features “Crazy” can be ordered on the Gohan Records website. The release is also available as a digital download on the Gohan Records website and on most iTunes stores. The wait is over: Exclusive 40-sec audio clip of Mono Band’s “Flame” featuring Kate Havnevik is here. The audio clip, kindly offered by Noel Hogan for Cranberries World’s “Mono Band Week” is the first of two unreleased tracks which are being revealed to fans for the first time ever! Let’s hope for a full official release sometime in the near future. On November 26, 2007 the Monoband.co.uk website revealed that two previously unreleased tracks [‘Flame’ and ‘Angels’] featuring Kate Havnevik on vocals were being mixed by Noel and would be available for download soon after that… but the downloads never appeared. This version also remains unreleased up to this date. In celebration of the “Mono Band Week”, Cranberries World features a Mono Band song every day of this special week. Today’s song is “Brighter Sky” [Ming & FS Remix] featuring Soname Yangchen. “Brighter Sky” was aslo remixed by Steve Hillier, Lovesky and Stuhr. The orginal version of the song was produced by Noel Hogan, Matt Vaughan and Marius DeVries. “I went with a different sound on ‘Brighter Sky’ because I needed to do something unlike anything I had ever done before. I knew at the time I wanted to take a different direction in the writing, I had been writing this way for many years, so it was more for myself then anything else. I was doing the best I could to get away from the sound that people were used to hearing from me, this is also the reason the track was put first on the album” told Noel Hogan in 2005. 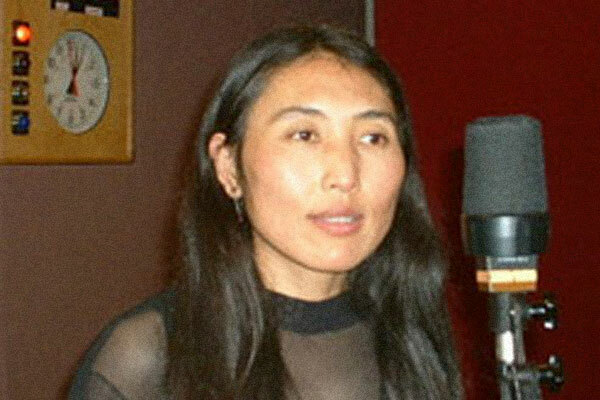 Soname Yangchen was born in Tibet and now lives in England. She performed with acts such as Zero 7 and the Asian Dub Foundation. She released two solo albums, “Unforgettable Land” (2006) and “Plateau” (2009). All Mono Band remixes are available on the digital release of “Remixes” on iTunes. A signed limited edition vinyl featuring “Miss P” (Steve Hillier Mix), “Brighter Sky” (Steve Hillier Mix), “Brighter Sky” (Lovesky Mix), “Brighter Sky” (original version – Marius De Vries Mix) is also available on the Gohan Records website. In celebration of the “Mono Band Week”, Cranberries World will feature a Mono Band song every day of this special week. We start off today with “Waves” featuring Richard Walters. “Waves” was the first single released from the 2005 “Mono Band” album. “A big influence for this track came from listening to an album by Stina Nordenstam called ‘And She Closed Her Eyes’. I have always been a big fan of this album, I hadn’t heard it for ages and then when I was in the middle of recording the album I started listening to the album again. The result was Waves” told Noel Hogan in 2005. The song, produced by Noel Hogan, Matt Vaughan and Stephen Street also features drums by Cranberries member Fergal Lawler. Richard Walters was the main Mono Band/Arkitekt contributor over the years. In 2007, Noel and him continued working together under the band name “Arkitekt”. 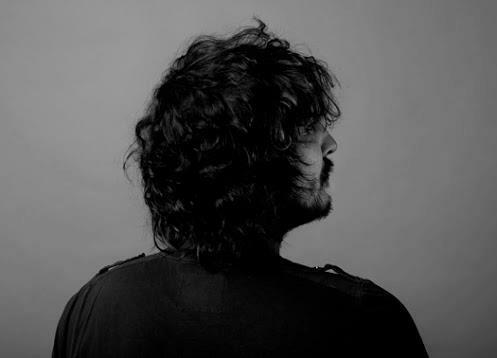 Two years later, Walters released his first solo album “The Animal” then “Pacing” in 2011 (which features new versions of his Arkitekt collaboration with Noel) and the “Young Trees” EP later that same year. Richard is about to release a new album “Regret Less” which is now available as a pre-release on pledgemusic.com. You can buy the “Waves” CD-single and the 2005 “Mono Band” album from the Gohan Records website. Both releases are also available as digital downloads on the Gohan Records website and on most iTunes stores. Tell Cranberries World which of the 12 songs from the 2005 “Mono Band” album is your favorite. Which 'Mono Band' album track is your favorite? New information about Noel’s side projects will be added to the Cranberries World site over the next week and a theme will be featured every day. We’ll start off the “Mono Band Week” Monday with the 2005 eponymous release. On Tuesday, it will be all about the Mono Band remixes. Then, we will post information about demos and other digital releases (Wednesday), concerts (Thursday), promo performances and unreleased songs (Friday), Arkitekt (Saturday) and the 2011/2012 Mono Band rebirth (Sunday).